I thought that after making so many sweet things this month I was going to keep my hands off the sugar jar. No such luck, had to make some dessert a few days ago as I had invited relatives over for dinner. Most of my friends and relatives probably expect that I will have made some dessert instead of indian sweet. So serving them fruit salad with ice cream seemed so boring to me. The first time I had this dessert was at Marie Vyas’ home when she had invited Ajay and me over for dinner. I got some nice juicy crunchy apples and Verity her daughter was coming for dinner. I am sure Verity does not remember much about her mum as she passed away when she was very young. However, I made this dessert so that Verity could taste it and make it whenever she wants to. Its like passing a bit of Marie’s remembrance to her daughter. Grease a 8X8 inch baking tray or a rectangle tray of approximately 11X7 inches (or something nearby) with butter. Just use an oven proof tray. Peel, core and slice the apples. Mix in the lemon juice. Make a layer of sliced apples in the greased tray. Sprinkle the raisins over it. Sprinkle the crisp layer over the apples evenly. Cover and leave till your guests or family members arrive. Just before you sit down for the meal, preheat the oven to 180°C. Remove the cover from the tray and bake the dessert for 25 to 30 minutes or until the top becomes golden brown. 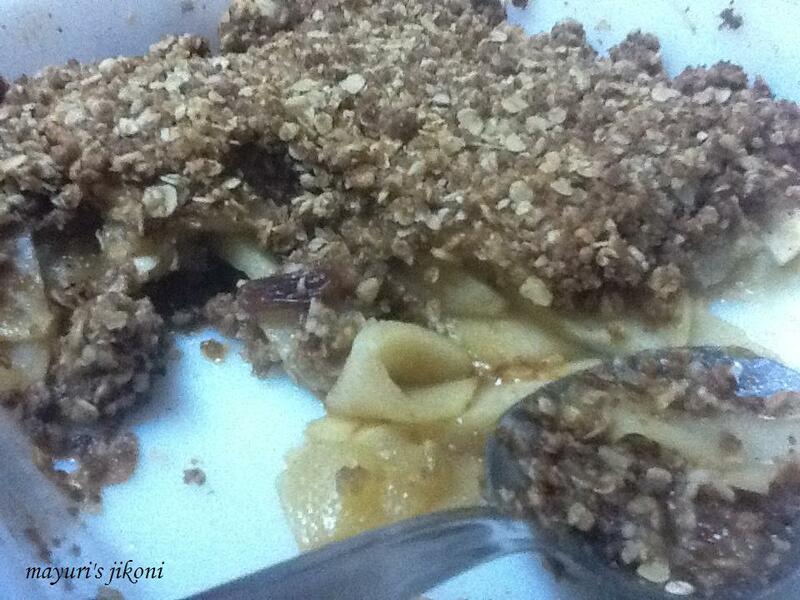 Serve hot apple crisp with a scoop of vanilla ice cream or whipped fresh cream. Add a handful of blueberries to the sliced apples before baking. Can add ½ tsp nutmeg powder to the crisp layer. Use half wheat flour and half plain flour for the crisp layer. Use crunchy pears instead of apples. My family loves more of the crisp layer. You can half the recipe if you want a thin layer.